I am pleased to report that I will be a program participant in the first-ever Trek Trax Atlanta convention on February 18-20 at the Atlanta Perimeter Holiday Inn! I will be on a Saturday morning panel discussing "Klingons in Literature" with Kelly Rowles, a freelance editor & writer. She's got some great words and pretty pictures on her blog, Dreadpiraterose. Should be a fun time! If you have any suggestions for noteworthy books and comics featuring Klingons, please feel free to send them my way! This weeks show we will be taking a look at what happens when dinosaurs roam the streets of modern day England in the TV show Primeval. Then later we will be having Marc Ballard on to get an early preview of all the upcoming Comic City Conventions. Join us for another fun filled podcast that we like to call Episode 44 – Time Traveling Dinosaurs, Who Would of Thunk it? Listen to ESO #44 here, or download this podcast from iTunes. 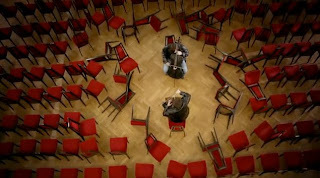 The way Stjepan Hauser and Luka Sulic play the cello is criminal. 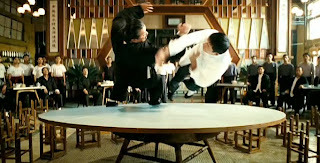 IP Man 2 is the second installment of the life of the Chinese master who trained Bruce Lee. Told only the way Hong Kong filmmakers can tell it! Another well made fan film. 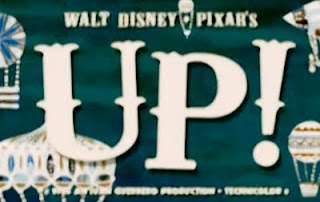 I am not a fan of a lot of remakes, but I do like "Premakes!" 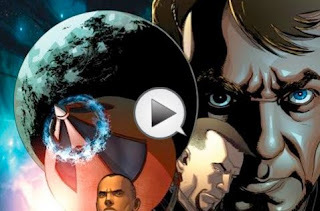 I am pleased to announce the first official Marvel trailer on display at www.ComicBookTrailers.com is promoting Orson Scott Card's Formic Wars: Burning Earth. Hopefully, it is the first of many more to come! As you can tell from the photo above, one thing that separates Planet Comics from many other shops is that it is open at night! 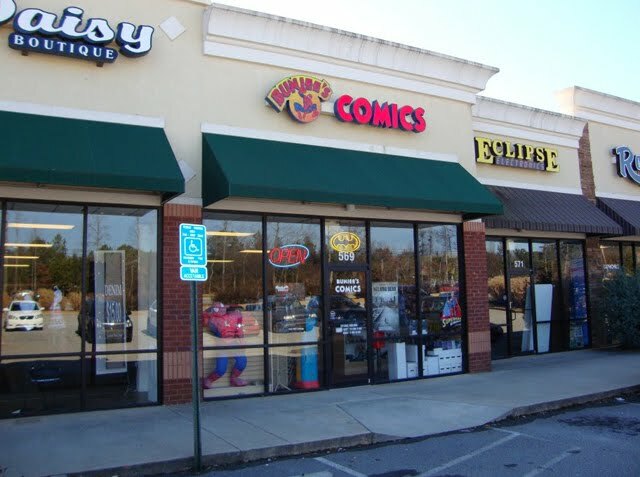 We arrived at a time when most comic stores I know of would be closed. It was nice to see the place buzzing with people on Saturday night, particularly the gaming area. You can find a great selection of current comics and back issues, as well as discount books and an impressive anime and dvd section. 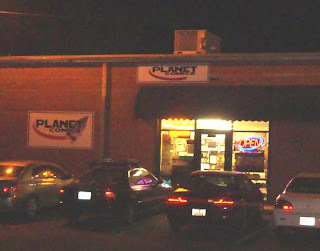 So if you find yourself out on the town in Anderson, stop by Planet Comics for an after dinner treat! 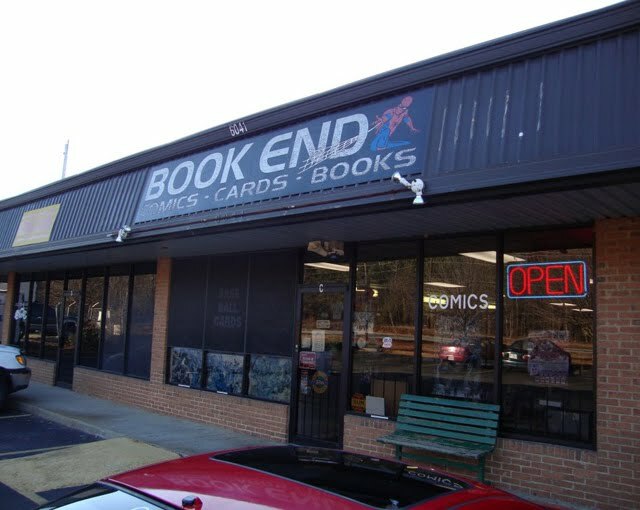 While we were in Greenville, we went from one of the smallest stores (in square footage) so far on our tour, to one of the largest. And the two shops are mere blocks away! Robert Young is the new owner of Borderlands and he has some big plans to go with his big store. He has been in the comic retail business for over 20 years and is a passionate believer in the medium and great supporter of creators. Listening to some of his ideas, I know this will be a store to watch in 2011 and beyond! In addition to everything you'd expect from your LCS, Borderlands is also THE place to be for wargaming. Between all the gaming tournaments and comic events Rob has scheduled for this year, I have no idea how he's going to get any sleep! 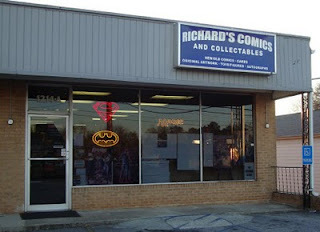 One of the dealers at the Charlotte Mini Con this weekend was Richard Morgan, and we also made it a point to visit his store on the return trip. And I'm so glad we did! 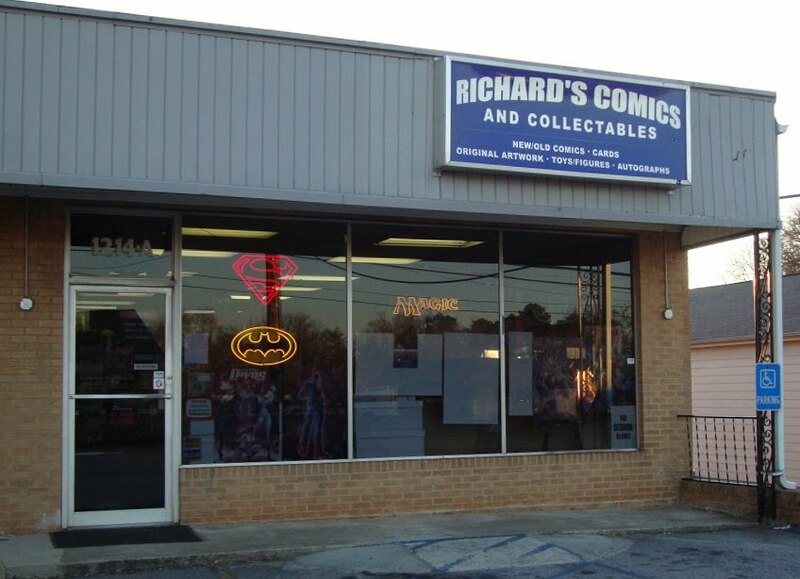 Out of the many stores I have visited, Richard's Comics & Collectables gets my vote for best maximum use of minimal space! I can't believe all the items in this store - the current titles, decent backstock, shelves full of trades, figures and statues, original comic art for sale, gaming cards, and much more. I actually nearly got lost looking around the shop and it is one of the smallest ones we've been to! Not only did I find some cool stuff to buy, but also gave me some ideas for organizing my own geek space. This past weekend, we decided to take our LCS Tour out of the state, mainly because we were going to check out the Charlotte Mini Con, operated by Shelton Drum. 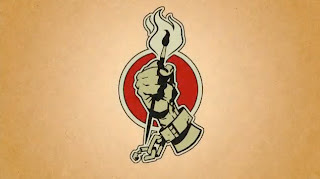 The con itself was fun, though on a smaller scale than Shelton's world-renown "other" convention - HeroesCon - one of my personal fave cons every year. 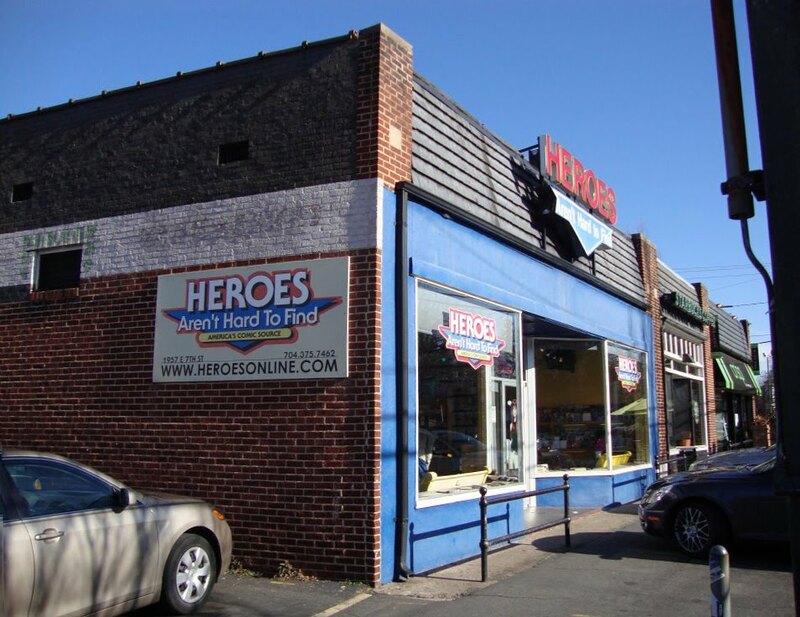 Though Shelton is recognized as the organizer of some great cons, he is also the owner of one of the best comic stores in the world, Heroes Aren't Hard to Find. Much like his conventions, comics not only take center stage, but nearly the entire stage! You will find an impressive assortment of current monthly titles (main and indie) as well as trades. There's a decent kids section in front and sweet statues throughout. And the life-size figures of Spider-Man battling Doctor Octopus hanging overhead are noteworthy attractions for any kid at heart! 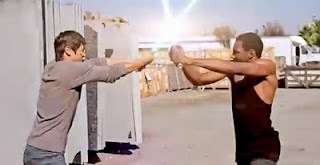 So if you are ever in the Charlotte area to attend one of Shelton's cons (and you should! ), make sure you stop by Heroes Aren't Hard to Find. And if you happen to be in town when there is not a con, never fear! The same atmosphere and spirit can be found at shop on a daily basis! 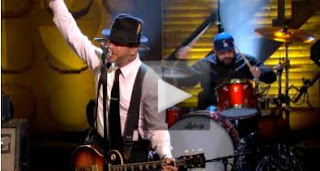 Social Distortion is back with a new album and they still ROCK! Wes Craven's Scream 4 looks like it might be worth checking out. Did I mention Kristen Bell is in it? 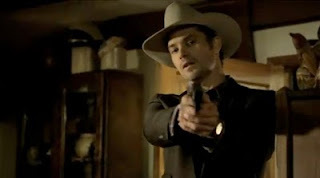 Three and a half weeks until season two of Justified! 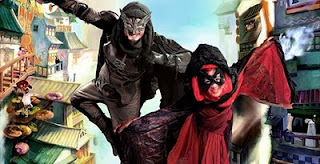 If you have not seen this show, season one is now on DVD! New comic series from the publisher of Arthur: The Legend Continues! 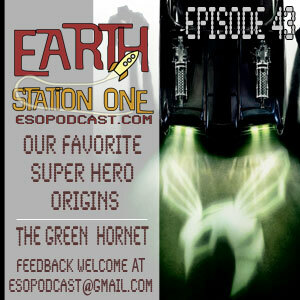 This week’s episode of the ESO podcast, comes to you live from Galactic Quest Comics in Lawrencville, GA as we sit around and discuss our favorite Super Hero Origins, and then we review the new Green Hornet movie starting Seth Rogan. 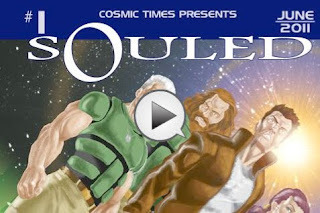 Join us for another fun filled podcast that we like to call Episode 43: Live From Galactic Quest Comics, You Call That an Origin? Listen to ESO #43 here, or download this podcast from iTunes. This year will mark the 20th anniversary of Galactic Quest, and I have been a subscriber at the Lawrenceville store for over 15 years. Over the years, both the store and myself have had our share of ups and downs, but my stack has been consistently there for me each and every week. 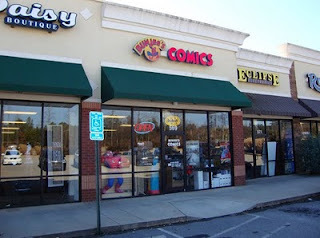 I used to think that it would be cool to own a comic store, but Kyle (the owner) made me realize that it is not enough to provide comics for folks each and every week, you must also build a community. Over the years, I've seen gaming tournaments, 24-hour artist marathons, art exhibitions, locally televised events, movie screenings, concerts, signings, and even a live podcast recording (co-hosted by yours truly just this past weekend). Not only do I appreciate the store as a fanboy, but as a creator as well. 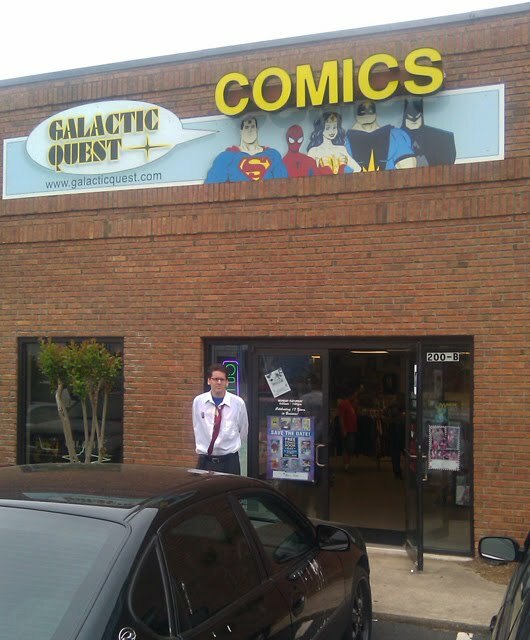 So please be sure to visit Galactic Quest, and if you do so on a Friday late afternoon, odds are I'll be there picking up my books! This week we take a peek at the animated side of the Lucas Universe and talk about Star Wars: The Clone Wars, and then we are joined by Chris from SciFi Summercon to chat about his upcoming show. 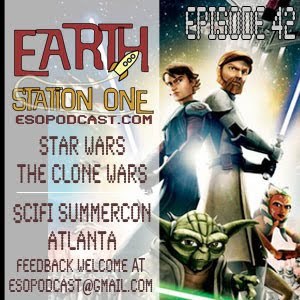 Listen to ESO #42 here, or download this podcast from iTunes. 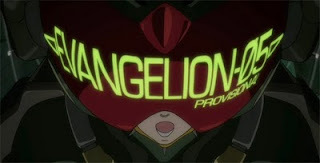 I love me some mechas! Warning! This video may ruin fantasies you've had since you were a teen! 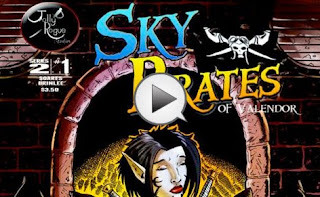 The fine folks at Jolly Rogue Studios have begun a second series of Sky Pirates of Valendor! 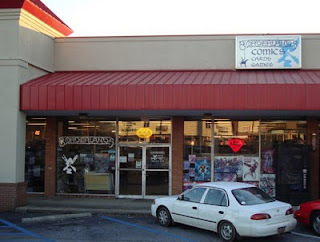 Bunjee's Comics has been in business since 1993. The first store was in Griffin, GA and later they opened a second store in McDonough. Sadly, last year the decision was made to close the Griffin store. 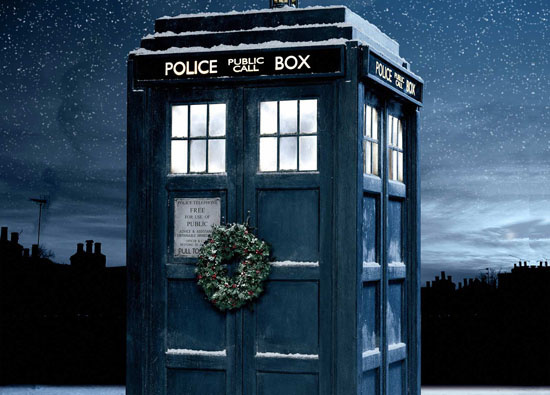 I wish I'd visited the original as I've heard great things about it from fanboys and fangirls in the area. I had been to the McDonough store a couple of times a few years ago and was impressed by the selection and the service. I'm pleased to say that both are still excellent! This was the first time I'd had the pleasure of speaking with Bill, the owner, who was in good spirits despite the recent consolidation. In fact, he very much wants to expand the remaining store to accommodate the combined inventory. For a store in the southern outskirts of Atlanta, the stock of books and figures is impressive! In addition to the latest and greatest superhero comics, you'll also find a diverse array of indie titles. 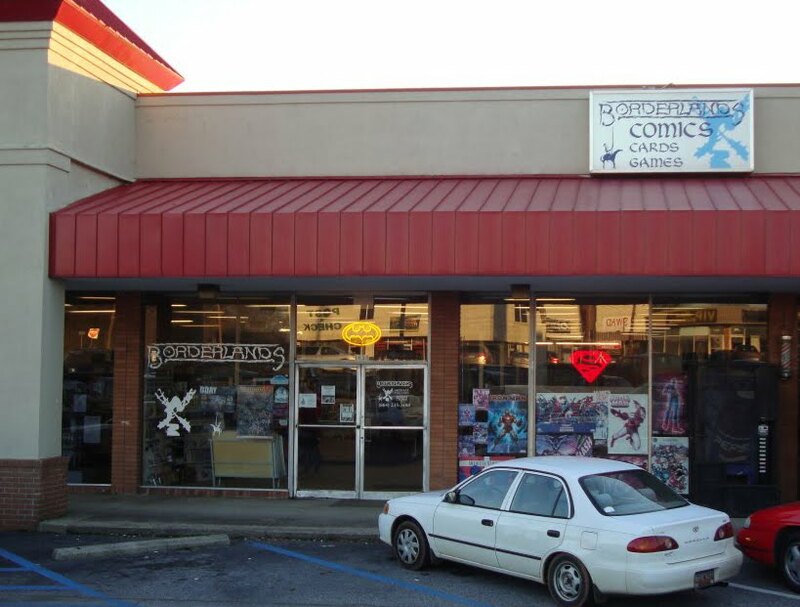 I don't often get a chance to travel to McDonough, but Bunjee's Comics is worth the trip! 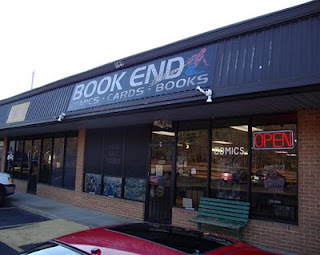 To be honest, I had never heard of The Book End until Bill from Bunjee's generously recommended we check it out, and I'm glad he did. I felt right at home as soon as I walked in the store! In addition to a wall full of new releases, the place is chock full of back stock. My budget would not allow me to dive in, but I spotted some rare gems just looking casually though the boxes. The place had an active crowd of card gamers which was nice to see among the used books and memorabilia. It was a real treat to chat with Paul, the co-owner, who made sure we left the store smiling! Much thanks to both stores for their hospitality and thanks to Bobby for the photos and the driving duties! I also want to thank Mother Nature for not snowing on Saturday! 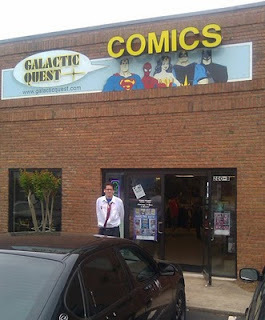 I look forward to visiting more local comic stores in the near future! Happy New Year from all of us here at the ESO Podcast! 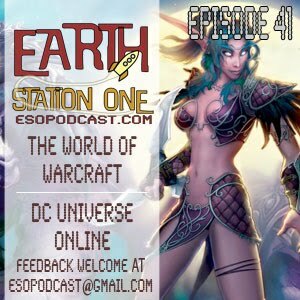 We welcome the first episode of 2011 where this week we will be taking a peek at online MMO, or an on line Massively Multiplayer Games for the novices out there, but more in particular the hugely popular World of Warcraft and the upcoming DC Universe Online. Join us for another fun filled podcast that we like to call Episode 41: Murlocs, Orcs, and Night Elves Oh My! 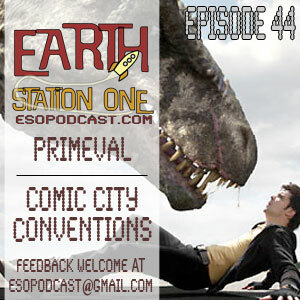 Listen to ESO #41 here, or download this podcast from iTunes. 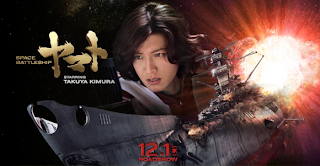 Last month, Space Battleship Yamato opened in Japan and I cannot wait until it is shown in the U.S.! 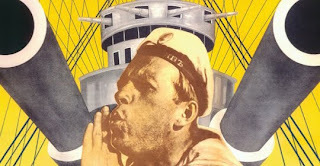 Speaking of famous battleships, look what has just been restored! 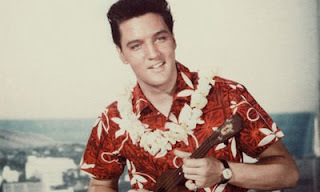 Elvis would have been 76 this week. Here's one of my favorite songs from one of my favorite of his movies. 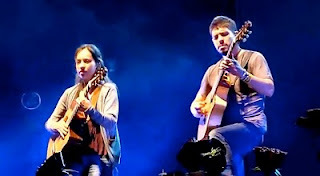 I had never heard of Rodrigo y Gabriela until I caught them performing at last summer's Glastonbury concert (thanks to Palladia for airing the concert during the holidays). Now I can't hear enough of them! IMHO, this fan-made trailer for the original TRON movie is better than the actual film! The first volume of one of the best comic series from 2010 is now available in trade! It has been a while since I posted a fave cover, but when my monthly order from DCBS arrived this week, I had to share one of my favorite pieces of artwork from 2010! Last year, I was very excited to read this mini series from IDW after seeing this image, which was a variant cover for Mystery Society #1. I like Steve Niles and would have checked this out anyway. 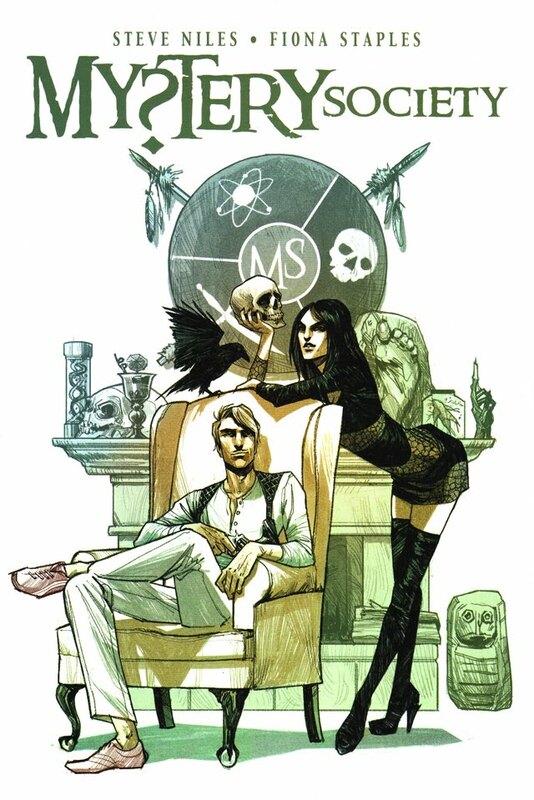 I also knew Fiona Staple's work from Done to Death and Vampirella, but to be honest, the names attached to this project were meaningless to me after seeing this image. It has a sense of fun, adventure, and sexiness that appeals to me as much as cheese on a pizza! (That's a lot, by the way.) And I am very pleased to report that this is a definite case of being able to judge a book by the cover. 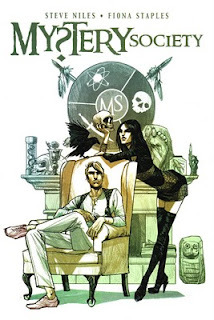 The book is one of my faves from last year and I want more stories of the Mystery Society! In the final episode of 2010 we warm up our TARDIS and we talk about this years Doctor Who Christmas Special "A Christmas Carol," and how it compares to previous years Doctor Who Holiday Specials. 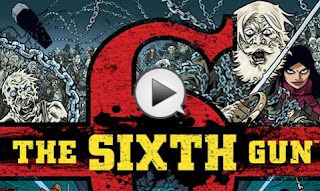 We then sit down and talk to Bret Herholz, creator of the graphic novel, “Sherlock Holmes: The Painful Predicament of Alice Faulkner." Listen to ESO #40 here, or download this podcast from iTunes.